(Nanowerk News) Don't go sticking your electronic devices in a toaster oven just yet, but for a longer-lasting battery, you might someday heat them up when not in use. Over time, the electrodes inside a rechargeable battery cell can grow tiny, branch-like filaments called dendrites, causing short circuits that kill the battery or even ignite it in flames. But thanks to new experiments and computer simulations, researchers from the California Institute of Technology have explored in detail how higher temperatures can break down these dendrites -- and possibly extend battery lifetimes. A battery cell consists of a positive and negative electrode, called the cathode and anode. As the battery produces electrical current, electrons flow from the anode through a circuit outside the battery and back into the cathode. Having lost the electrons that are generating the current, some of the atoms in the anode -- an electrically conductive metal like lithium -- become ions that then travel to the cathode, moving through a conductive liquid medium called an electrolyte. Recharging the battery reverses the process, and the ions travel back and stick onto the anode. But when they do, the ions don't attach evenly. Instead, they form microscopic bumps that eventually grow into long branches after multiple recharging cycles. When these dendrites reach and contact the cathode, they form a short circuit. Electrical current now flows across the dendrites instead of the external circuit, rendering the battery useless and dead. The current also heats up the dendrites, and because the electrolyte tends to be flammable, the dendrites can ignite. Even if the dendrites don't short circuit the battery, they can break off from the anode entirely and float around in the electrolyte. In this way, the anode loses material, and the battery can't store as much energy. "Dendrites are hazardous and reduce the capacity of rechargeable batteries," said Asghar Aryanfar, a scientist at Caltech, who led the new study that's published this week on the cover of The Journal of Chemical Physics ("Annealing kinetics of electrodeposited lithium dendrites"), from AIP Publishing. Although the researchers looked at lithium batteries, which are among the most efficient kind, their results can be applied broadly. "The dendrite problem is general to all rechargeable batteries," he said. The researchers grew lithium dendrites on a test battery and heated them over a couple days. They found that temperatures up to 55 degrees Celsius shortened the dendrites by as much as 36 percent. To figure out what exactly caused this shrinkage, the researchers used a computer to simulate the effect of heat on the individual lithium atoms that comprise a dendrite, which was modeled with the simple, idealized geometry of a pyramid. The simulations showed that increased temperatures triggered the atoms to move around in two ways. The atom at the tip of the pyramid can drop to lower levels. Or, an atom at a lower level can move and leave behind a vacant spot, which is then filled by another atom. The atoms shuffle around, generating enough motion to topple the dendrite. By quantifying how much energy is needed to change the structure of the dendrite, Aryanfar said, researchers can better understand its structural characteristics. 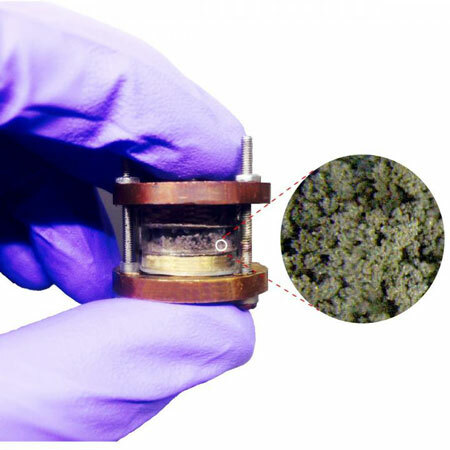 And while many factors affect a battery's longevity at high temperatures -- such as its tendency to discharge on its own or the occurrence of other chemical reactions on the side -- this new work shows that to revitalize a battery, all you might need is some extra heat.